Considering that the HTC Rhyme recently saw its price dipping to the oh-so wonderful free on-contract level, it’s also perfect timing that new handset owners will soon be seeing a new software update for the smartphone. 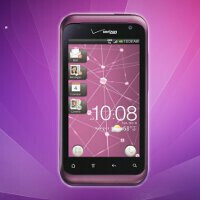 Although there’s no exact time frame on when it’ll be available for download, the plum colored version of Verizon’s HTC Rhyme will soon see the version 2.20.605.3710RD update. So what is it going to bring along? “Ringtones” has been replaced with “Edit Home” when the Menu key is pressed on the homescreen. Naturally, it’s fine and dandy that we’ll be seeing these enhancements and all, but the update also manages to pack some new features that’ll spiffy up the handset’s visuals. Specifically, owners will notice a new in-call volume control when the handset is placed in Dock Mode – as well as being given an “All Apps” option too. And for those plagued with the volume changing to 20% when in Dock Mode, it’s being resolved with this update. Again, there’s no specific time frame on when it’ll be available, but in any case, we can most certainly expect to see it soon nonetheless. Just keep an eye out for it!